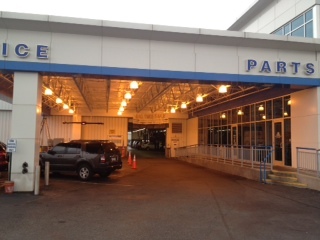 Brand New Alignment Check Machine in Waldorf Ford’s Service Lane! Today I was pleasantly surprised to see our service lane transformed. What was once a very nice and steady service drive lane, here at your local Southern Maryland Ford Dealer, was now an active and exciting place! 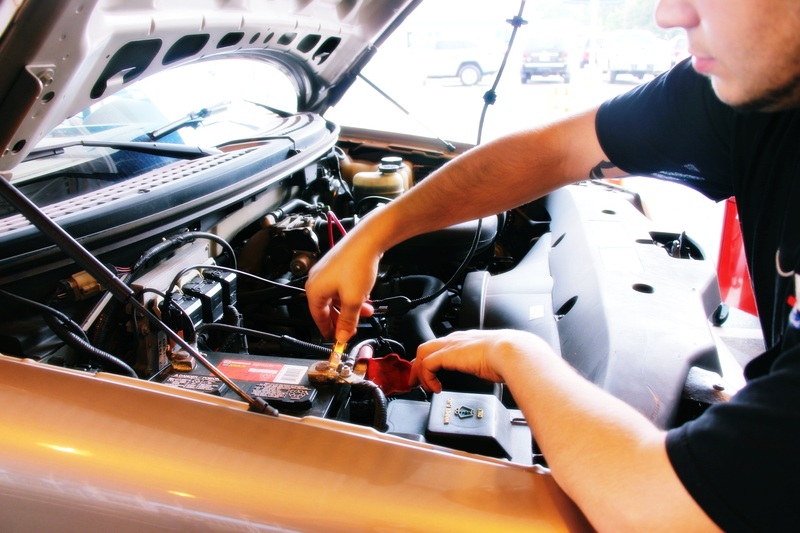 It was great to see both service employees and customers actively engaged in their vehicle health! Today was the debut of the brand new wheel alignment check machine. Here is some trivia for you: Did you know that approximately 60% of vehicles are out of alignment? After hearing that percentage many customers (me included) were definitely taking advantage of this complementary service. I was asked by Hunter Engineering’s manufacturer representative if I would like a complementary vehicle inspection that only took 3 minutes! I thought awesome! Convenient and FREE? What more could I ask for? I did have some questions though. It just seemed too good to be true. Questions like: how were they able to inspect my vehicle in such a short amount of time? How did the computer work? How could it be free? Well, Hunter Engineering Company‘s Representative was very excited about the freshly installed alignment check machine and was more than happy to explain how it worked. He also encouraged me to learn how the process worked. He first gave me a step by step demonstration on the inspection process and before I knew it; I was able to inspect the vehicle myself! 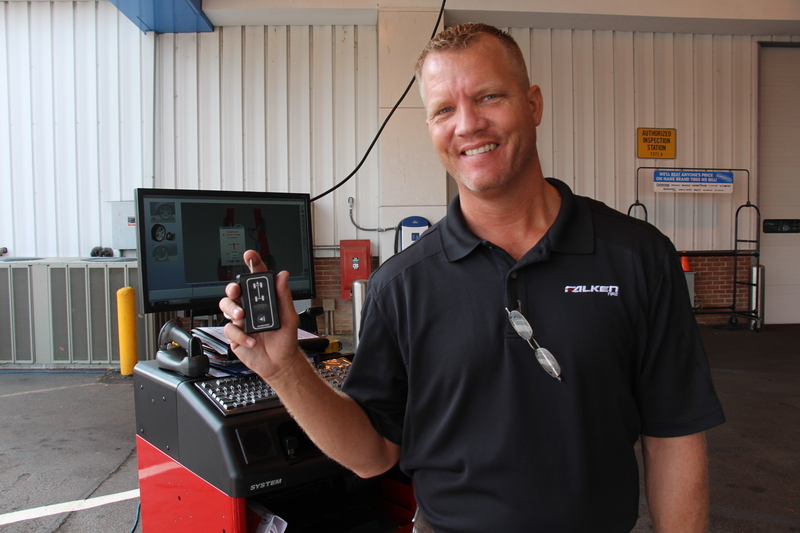 The Hunter Quick Check Inspection Process is more than just an alignment quick check system; it allows the operator to optimally test key maintenance items like batteries and tires. Did you know that over 10% of vehicles have battery related issues? Like many of us, the battery is an afterthought but it’s so easy to test. So, the first thing we did was test battery. During the test we made sure that it was within OEM (Original equipment) specifications. Luckily mine was Green for Good; not Red for Bad! Also, did you know that over 20% of vehicles have one or more tires in need of replacement? That’s right, so that’s why we checked for tire tread depth and tire pressure. 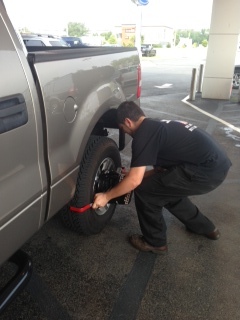 What was most cool about this was that they let me check the tire tread depth and pressure on my own – it was so easy! 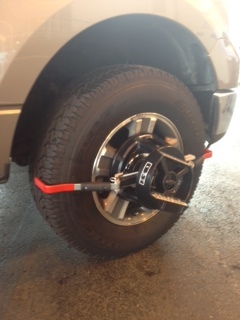 I got to use this super cool Tread-Depth tool that allowed you one or three-point tire readings. 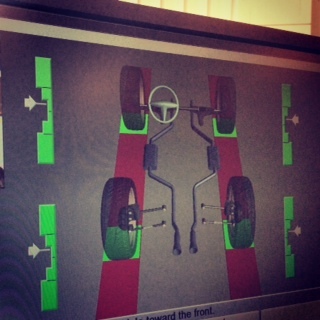 Finally, we determined whether the vehicle needed a wheel alignment. Everything was in the green which was good. All of this information was taken by a photo capture that then forwarded to the control console. Which then after calculating was able to create a special customized printout that clearly outlined all my test results! This process was super cool and quick. Thank you to Waldorf Ford’s Service Department! The FREE Wheel alignment Quick Inspection definitely gave me piece of mind! 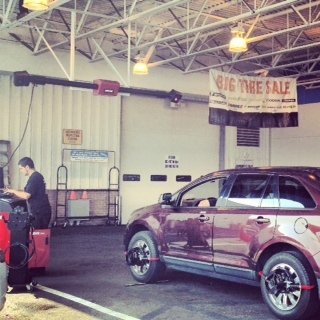 Stop by Waldorf Ford’s Service Department for your FREE Alignment Check!